I find the Kodak i1210 Plus Scanner to be an excellent device. It is extremely easy to use and set-up. I also find it to be very fast and robust. If I was to find a criticism then it would be the cost of the flatbed attachment. 4 out of 5 as a result! Bought this mainly for batch scanning the 5000 or so photos I have from my life before digital photography. Got through all of them in a couple of weeks. Now use it for scanning all my mail and multi page documents. Terrific piece of kit. We would rate this product highly and give it a 5 (excellent) rating. We have a large scanning requirement running to several hundred copies per week and this product meets our specification to the full for a machine which is reliable, robust, speedy, easy to set-up and operate. It's not the cheapest in the market, but then our experience is you get what you pay for! We did have initial problems with the set up but these were quickly dealt with by your support team, who were easily contactable. Thanks for your recommendation of an excellent machine. I have spoken to the people who use the machine on a daily basis and the feedback is mixed. The hardware and performance once it is working scores a 4, however the software seems a little flakey. The settings have to be reset daily particularly when we are choosing to use "Omni page" in conjunction. This part scores a 2, so I suppose the overall score would be a 3. Thanks for providing excellent advice to help us purchase our new scanner (Kodak i1210). Given that we had no idea what we needed, it was good to be directed to a cost effective option that has proved simple and effective in use. In comparison to the HP model we’d been recommended by PC World and used for a year, the new one is lighting fast and provides excellent images. 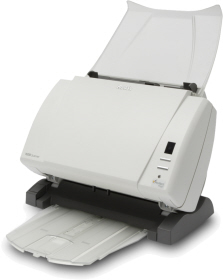 Small, powerful and packed with features and benefits, the Kodak i1210 document management scanner delivers on your desktop scanning needs with an unprecedented combination of performance, value and price. KODAK Service & Support for the peace of mind that lets you do what you do best-run your business.